Jonathan Frigeri reveals inaudible messages, like “oracles“ that are hidden to the human ears, “probably telepathic messages, from other minds deep in thought” (John Cage). 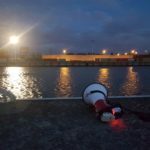 Equipped with a special recording device that capture electromagnetic waves through the air, he will explore public and private spaces in Brussels. Whenever he finds an interesting “message” he will install an object (translator and amplifier). The final outcome will be a cartography of possible oracles spread out over the city. A final presentation of this network of oracles will be broadcasted via Radio Campus.